An interim report into the failure of nine heavy-duty nuts on the Forth Road Bridge has found all 1,888 similar nuts on the crossing should be replaced. Bridge authority Feta ordered the investigation after inspectors found nine cracked nuts during a routine inspection last year. 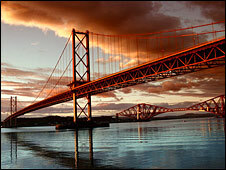 Engineers FaberMaunsell carried out lab tests and a study of similar issues on suspension bridges across the world. The nuts are used to secure 192 "cable bands" to the bridge's main cables. Cable bands are metal castings over which the steel rope hangers holding up the roadway are looped. Each cable band is held in place by a number of 35mm diameter-high steel bolts, pre-tensioned to a load of about 80 tonnes. All the cable band nuts and bolts were replaced in the late 1990s as part of a larger project to replace the hanger ropes. The bridge authority's investigation found design and specification decisions and construction methods that may have contributed to the cracking. They found the replacement of the original 1.5in bolts with metric M39 bolts resulted in the nuts having a thinner section than the originals . The dimensions of the new nuts are also "particularly small" compared with similar nuts on other suspension bridges. They also found a much higher grade of steel specified in the replacement nuts meaning they are much harder and less flexible than the originals. The report also found misalignment of washers may have led to uneven loading in the nuts and the protective coating on the nuts was inadequate and allowed moisture to cause damage. Four of the failed nuts have already been replaced on the west cable, using access platforms already in place. The five failed nuts on the east cable will be replaced in the course of this year. Barry Colford, bridgemaster and chief engineer, said: "Thanks to the vigilance of our inspection team this problem was identified at an early stage and the bridge remains perfectly safe. Cracks have been found in only nine out of 1,888 similar nuts. "Nevertheless, our investigation has concluded that any of these nuts could potentially fail in future, so the recommendation is to replace them all as a precaution. "We're planning to carry out further tests in the laboratory before bringing a final report to the Feta Board later this year." The interim report said legal advice had been sought by Feta to establish whether there was any liability on the part of the designer or the contractor who replaced the nuts in the 1990s. The outcome depends on the investigation's final report, due later this year.